Plastics degrade after some time in the environment through hydrolysis or oxidation, making them weak and brittle. Full bioassimilation takes much longer, particularly in the ocean. Biodegradable polymers require industrial composting conditions to degrade fully. It is difficult to make materials with useful properties that degrade under less extreme conditions. 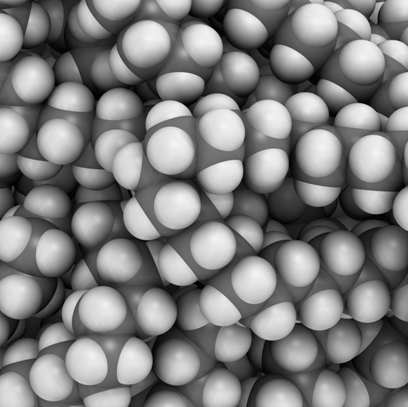 The modern world is unimaginable without polymers, one of chemistry’s greatest contributions to human welfare. Thermosets like phenolic resins, which are crosslinked to the point of being essentially single molecules, are extremely durable and are used most in long-lived products. Less crosslinked polymers with mobile chains form rubbers, usually highly formulated mixtures loaded with carbon black and additives. However, the largest volume products are thermoplastics, typically linear chain polymers that soften on heating and can be processed into films, fibres, and bulk products. Plastics consume waste products of the petroleum industry. In typical packaging applications, they save energy, waste, and emissions compared with alternatives. Current estimates put annual world production of plastics at over 250 million tonnes (1). The “big six” in market share – polyethylene (PE) (Figure 1), polypropylene (PP), poly(vinyl chloride) (PVC), polystyrene (PS), poly(ethylene terephthalate) (PET), and polyurethanes (PU) – account for around 80% of the demand for plastics in Europe. Polymer properties are temperature-dependent because a ductile response to stress depends on the chains being able to change conformation fast enough for stress reduction without brittle fracture. An important parameter is the glass-transition temperature, above which long-range cooperative motions allow the polymer to flow. Most hard polymers have a glass transition temperature between 80 and 200 °C to minimise creep at room temperature while allowing processing without degradation. PVC and PS are glassy and amorphous, with chains having no packing order. At room temperature, both are rigid and brittle. They and PU are mainly used in long-term applications, particularly construction and insulation. In contrast, PE, PP, and PET are semi-crystalline, with about 50% of the polymer being regularly packed in small crystals, while the rest is amorphous. These interlocking crystalline and amorphous regions stiffen and toughen the polymer at temperatures between the glass transition and the melting point. If the amorphous component has a glass transition well below room temperature (as is the case for PE), the material is extremely tough, whereas a higher glass transition improves strength and stiffness (as for PP and PET). PE, PP, and PET are extensively used in short-life applications, particularly packaging. The first industrial polymers were modified natural materials, notably natural rubber and celluloses. Modern plastics are mostly derived from oil, although they represent only about 4.5% of oil consumption. Oil fractions can be converted into acids, amines, etc. 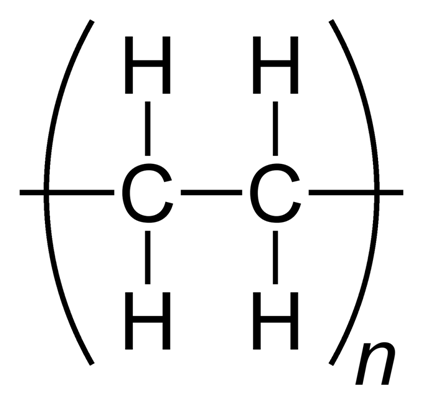 and reacted to give step-reaction polymers, with functional groups (such as ester, amide, or urethane) in the main chain. In contrast, polymerisation of olefins and vinyl monomers gives full-carbon backbones. There is growing interest in polymers derived from biomass, whether synthesised in vivo [such as poly(hydroxy alkanoate)s from bacterial fermentation] or from bio-derived monomers (such as polylactide from cornstarch-derived monomers). Although growing, bio-plastics are still a tiny fraction of the market. It is a myth that plastics are indefinitely stable in the environment. They get their mechanical properties from their very long, entangled, and perhaps crystalline chains, and even small levels of chain scission can destroy the toughness of a plastic, especially the semi-crystalline materials that rely on “tie” molecules to transfer load between amorphous and crystalline phases. Many polymers are unusable without additives to inhibit degradation. In common packaging materials, these additives are usually low-molecular-weight substances that interfere with degradation in many ways. They are consumed chemically and eventually stop protecting the polymer, which then degrades. Thus, plastics are not simple. The polymer often contain several additives, which may be there to improve the product, provide colour, aid in manufacture, prolong its life, or protect it from extremes, such as fire. In use or storage, the formulation will be exposed to a wide range of degradative influences, including oxygen and perhaps elevated temperatures, contacting liquids, sunlight, and atmospheric pollutants. Failure usually takes one of two forms: either the material starts to lose its surface appearance by discoloration, loss of gloss, or the formation of white deposits, or it cracks and breaks. Loss of toughness due to chain scission at ambient temperatures might be expected to occur by either hydrolysis or oxidation. Polymers such as polyesters that contain main-chain functional groups have potential for hydrolytic cleavage and might be expected to lose molecular weight in aqueous environments. Hydrolytic cleavage is, however, extremely limited in polymers like nylons and PET, because polymers are hydrophobic and the high glass transition temperature restricts chain mobility. By far the dominant mechanism of degradation of common plastics and rubbers is oxidation. Polymer oxidation is an autoaccelerating free-radical process that involves the formation and decomposition of hydroperoxide intermediates. It is accelerated by heat, light, and contact with transition metals. Reactions of the intermediate free radicals cause chain scission and produce polar products, including esters, ketones, alcohols and acids. Unlike hydrolysis, oxidation can be slowed (or accelerated) by small amounts of additives, and antioxidants are typically added to common thermoplastics at low (<0.1 wt%) concentrations. Although small amounts of chain scission in a plastic can produce a weak, brittle material, full bioassimilation is much slower. It requires the entangled chains to be cleaved to fragments that are small enough for assimilation, which requires a hydrophilic surface and functional groups that are attacked by water and enzymes. Polyesters are the most commonly used synthetic polymers that can biodegrade hydrolytically. However, there is a trade-off between biodegradability and physical properties. It is possible to make polymers that bioassimilate in less than a year in industrial composting at >50 °C, but it is extremely difficult to make products with useful properties that biodegrade significantly under less extreme conditions, for example in home composting. Carbon chain polymers are highly resistant to hydrolysis because they have no sensitive sites in the main chain and are hydrophobic. Once oxidised to low molecular weights, the polyolefins do become hydrophilic and biodegradable, but the time scales for completing the whole oxidation and bioassimilation process are extremely long unless pro-oxidant additives are used. It is particularly difficult for degradation of plastics to occur in the sea, although there is very little data on marine degradation. Hydrolysis is too slow at typical sea temperatures. Although solar near-ultraviolet light accelerates environmental degradation of most plastics, a crucial part of the acceleration is due to solar heating. The sea acts as an effective coolant, and a plastic that loses its properties rapidly in land solar exposure may last a great deal longer when floating in seawater. This article is based on the author’s talk at the 2014 ECG Distinguished Guest Lecture & Symposium. 1. Plastics: The Facts 2012. An Analysis of European Plastics Production, Demand and Waste Data for 2011, Plastics Europe. Brussels: Association of Plastics Manufacturers in Europe, 2012. ‘Plastics, the environment, and human health’, compiled by R. C. Thompson, C. J. Moore, F. S. vom Saal and S. H. Swan, Philosophical Transactions of the Royal Society B – Biological Sciences , 364, 1971-2166 (2009). ​M. C. Celina, J. S. Wiggins, N. C. Billingham, Norman, Eds. Polymer Degradation and Performance, ACS Symposium Series, American Chemical Society, Washington, D. C., 2009.